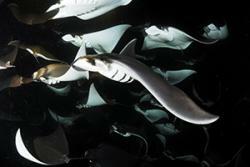 Mass feeding aggregation of reef mantas in Hanifaru Bay, Maldives. : Images copyright of Guy Stevens | Manta TrustWe know that trade and transport of ivory is strictly controlled to safeguard the elephants, and that other animal by-products such as the use of rhino horn is also controlled in an attempt to clamp down on the poaching and illegal trade which affects some of our most threatened species. Jane Hosegood is studying a PhD at the University and is developing genetic tools to identify devil rays and their parts, along with their sister-group, the manta rays. The team are working towards tools which will be able to identify a manta ray or devil ray to species level from small samples, and will also be able to identify which specific population, and therefore location, the ray came from. Jane is working alongside Prof Gary Carvalho and his team within the Molecular Ecology and Fisheries Genetics Laboratory at the University’s School of Biological Sciences. The team are world leaders in using genetic markers to identify fish species and populations, and their genetic tools to identify a wide variety of fish are now widely used to safeguard global fish stocks. Jane attended the recent CITES meeting in Johannesburg along with colleagues from the Manta Trust and TRACE Wildlife Forensics Network and so saw first-hand how events unfolded. 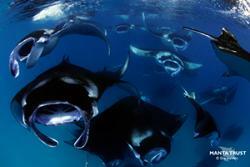 Among the topics up for discussion was a proposal to list all species of devil ray, (Mobula sp.) put forward by the government of Fiji. This recent success of this proposal highlights the importance of the work being carried out at Bangor University. The ongoing development of genetic identification tools which can identify a manta or devil ray, or any of its parts, down to species and regional level will assist those charged with enforcement and monitoring of CITES regulations. Basket of processed gill plates in Sri Lanka. 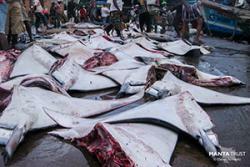 : Images copyright of Daniel Fernando | The Manta Trust“Both devil and manta rays are fished in huge numbers to supply the international demand for their gill plates, which are used as a pseudo-remedy in some traditional medicines. This trade is unsustainable, with these species being unable to recover from such levels of exploitation, due to the very slow rate at which populations reproduce. “Essentially what we are doing is taking tissue samples from individuals of known species and sequencing short fragments of the DNA that they contain. This allows us to build up a picture of the genetic signatures of each species and population, to which we can compare samples from an unknown individual or part. This assists us in identifying which species it came from. This Bangor-led study is funded through NERC, the Royal Zoological Society of Scotland, the Save Our Seas Foundation, the Fisheries Society of the British Isles, The People’s Trust for Endangered Species and the Genetics Society and is in collaboration with the Royal Zoological Society of Scotland, TRACE Wildlife Forensics Network, the Manta Trust and various other projects around the world.